An extra heavy umbrella base to ease your fears of toppling umbrellas; a set of wheels and a built in handle to make moving it easy; the Monaco Square Cast Aluminum Umbrella Base with Wheels and Handle is perfect. It offers 100 pounds of stability, but it is designed so that you can grab the built-in handle, tip it onto the 2 wheels, and move it at your ease. This is a great solution for a patio area that has no shade. You can simply move your umbrella to protect the patio furniture area that needs it at the time. And for commercial settings, this function has obvious appeal. The Monaco Square Cast Aluminum Umbrella Base with Wheels and Handle is crafted from both cast aluminum and iron; it has an iron core which is protected by a cast aluminum shell. If 100 pounds doesn’t quite do it for you, add the optional 30 pound weight to make it even heftier. The Monaco Square Cast Aluminum Umbrella Base with Wheels and Handle is available in your choice of three finishes: bronze, silver or black. This item ships via UPS / FedEx. Most delivery times within the Continental U.S for in-stock umbrella stands range from 2-5 business days depending on location. 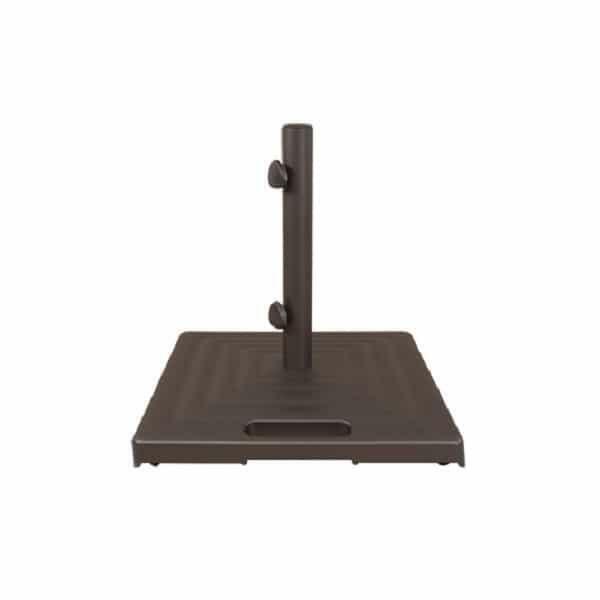 All in-stock umbrella stands orders received before noon will ship that SAME DAY. Shipping Details & Conditions.